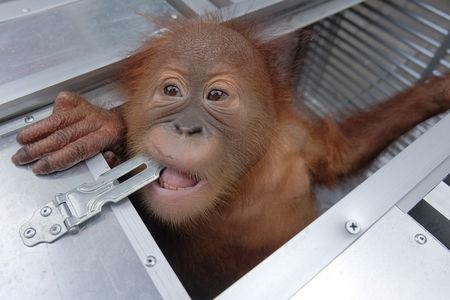 DENPASAR, Indonesia (Reuters) - A Russian man was detained at Indonesia's Ngurah Rai airport in Bali as he was caught trying to smuggle a young orang-utan in a suitcase, authorities said on Saturday. The two-year old male orang-utan appeared to have been drugged, officials said, and was detected during an X-ray security screening. "We suspect the orang-utan was given a drug to make it sleep as long as it was in the suitcase," I Ketut Catur Marbawa of the Bali Natural Resources Conservation Agency said in a statement. Orang-utans are native to Indonesia and Malaysia, found in the wild on the islands of Sumatra and Borneo. Some of the species are endangered and all are protected. The Russian national, Zhestkov Andrei, who also had two live geckos and five lizards in his luggage, was scheduled to fly to Russia, but he has now been detained by police. It was not immediately clear what charges Andrei would face. Illegal wildlife trade is rampant in Indonesia, despite efforts by authorities to crack down on smugglers. Earlier this month police arrested a man in Papua who had attempted to smuggle over 2,000 pig-nosed turtles, a protected species, out of the province.